SoftOrbits Photo Editor is equipped with a fully featured toolbox of photo editing tools. It’s the perfect photo toolbox you’ll ever need! Turn your digital snapshot into a perfect postcard! Be it a passer-by, a hanging wire or just an unwanted shadow, you can make your picture free of distracting objects with ease. Remove unwanted objects in just a click! SoftOrbits Photo Editor will help you selecting the whole object and re-create what’s beneath it, producing a clean, perfect postcard free of blemishes and distractions. I relay like it this software ! I removed some crap spots with the selection tool that pinpointed the crap spots and it removed them ! This is now my favorite photo editor cos i cant afford the others. It even erased the blurry parts ! Perhaps better you continue not to unless you possibly hire a reading and writing instructor? Photos we capture do not turn out to be perfect always, especially the portrait photos capture all the imperfections at that moment in time. These imperfections need to be eliminated and adjusted, before the photos are considered good enough to be shared with others. Expert photo editors have been using advanced tools for long to remove these unwanted defects and details. But not everyone wants to or can pay the photo editors, or pay for and use the advanced tools. That’s why simple applications to help solve this issue came into existence. SoftOrbits Photo Editor Pro is a lightweight and intuitive photo editor application, that can help you adjust and enhance your photos appearance with the aid of many useful tools that it comes packed with. It lets you edit and adjust the appearance of photographs, remove spots, apply text watermarks or crop the images, and do more. The installer size is ~10MB, and the installation process is simple and straightforward taking no time at all to complete. Once the installation completes, the application can be easily activated and registered using the license key. At startup, you can drag and drop any image to the UI, or use file explorer to navigate to the picture and select it. Once a photo is loaded, you can start using tools and features of the application to make your photos look better. The UI of the application is clean and simple, and all the features are well-organized making the UI easy to navigate through. At the top you have the menu bar with usual drop down menus, followed by toolbar with important features and tools. To the right is the toolbox, which shows tools relevant to the function you have selected from the toolbar. Rest of the UI is the image viewing area. Information like image resolution and the format are shown on the bottom right. – Clean and Simple, designed to be easy to use for all types of users, even novices. – Supports formats like JPG, BMP, PNG, GIF, TIGm TGA, PSD, PCX, WMF, and more. The edited image can be stored in these formats too. – Tools like Crop, Rotate, Remove, Add text, Image Correction, and Resize. – Add Text Watermarks, Remove objects from images by different modes and methods. – Menu bar lets you undo or redo certain actions, go to next or previous picture and restore the original. – Improve portrait photos by removing small imperfections such as pimples and wrinkles. – Often crashes while processing images. – Object removal takes a lot of time, but the results it produces are only satisfactory. 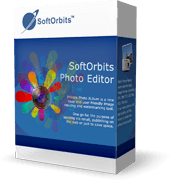 SoftOrbits Photo Editor Pro is a simple, lightweight, and intuitive photo editor designed to be simple to use, and aimed at all types of users, allowing them to edit and enhance their photos with ease, without any photo editing knowledge or complex photo softwares. The application runs fine, with a few stutters and crashes here and there. It is worth-trying.